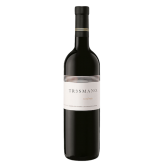 We were first introduced to Tr3smano on a road trip across Spain. Packed into a tiny car, we followed the Ribera del Duero on the recommendation of a trusted business associate and made our way to the thoughtfully-designed, low-slung modern concrete winery on the river’s “Golden Mile”. It was a highlight of the trip. The top-tiers of winemaking attract individuals who put in the work, who reach a little off the beaten path, who press a little harder, who take risks to achieve something special. We can say with confidence that this is the case with the three partners behind Tr3smano. Antonio Sierra González, Fernando Remírez de Ganuza, and Pedro Aibar bring years of experience to the project. The goal? To find the best vineyards in Spain for the production of red wine. This winery shows the best of a region that has knowingly turned its rough edges into a celebration of soil, vigour, and wine. This is a challenging landscape. Hundreds of years ago, the land here in Valladolid was a valley lined with olive groves. (A gnarled 1500-year-old olive tree still looks over the estate.) Today, 30 hectares of Tempranillo are rooted in the Tr3smano estate vineyard’s rugged nutrient-poor loam. Most are trained goblet-style, all are tended by hand. More vines are planted across the river in the Montes de Pesquera, and the winery collaborates with a number of local experts who tend to century-old plots. Only two wines, both premium expressions of Tempranillo, are produced. Harmonious and balanced, exceptional value, this is a superb expression of Ribera del Duero.